Solid Brass Communion Tray and Cover - Holds 40 Communion Cups by Living Grace by Living Grace at Rossetti Productions. Hurry! Limited time offer. Offer valid only while supplies last. Solid Brass Communion Tray with Cover Solid brass communion tray and cover with 40 hole insert. Stackable, durable design with lacquer finish. Solid Brass Communion Tray with Cover Solid brass communion tray and cover with 40 hole insert. Stackable, durable design with lacquer finish. Exclusive Design. Use brass cleaner to wipe clean. Handle with Cotton Gloves to preserve the life of your Communion Ware. 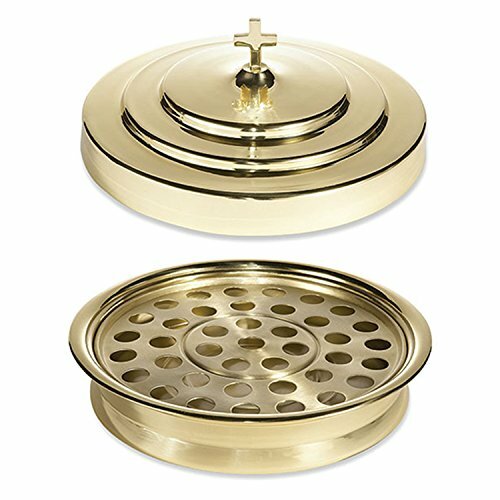 -- Solid Brass -- 12 3⁄8" Diameter for Communion Tray and 11" Diameter Cover. Exclusive Design.Stackable, durable design with lacquer finish. Use brass cleaner to wipe clean. Handle with Cotton Gloves to preserve the life of your Communion Ware. 12 3⁄8" Diameter for Communion Tray and 11" Diameter Cover.